Prestashop Set Your Delivery Location : Is tracking your customer's address proving to be a time wasting task for you? Don't worry we have got the perfect solution for you. Prestashop set your delivery location let your customers mark their exact delivery location on Google Maps so that you don't have to search by yourself at the time of order delivery. Prestashop Set Your Delivery Location - Is tracking your customer's address proving to be a time wasting task for you? Don't worry we have got the perfect solution for you. Prestashop set your delivery location let your customers mark their exact delivery location on Google Maps so that you don't have to search by yourself at the time of order delivery. Customers can set their delivery location while adding or updating their address. Option to set delivery location on the checkout page. View delivery location on the checkout, order confirmation, and order details page. Customers can search their location by exact address, places such as businesses or landmarks, and geocodes of the physical address. Admin has the capability to change/set the delivery location for the customer's address. Saves admin's time as admin does not have to search the customer's address. Allow the customers to mark their location on Google Maps while adding or updating their address. A customer can view its delivery location on checkout, order confirmation, and order details page. 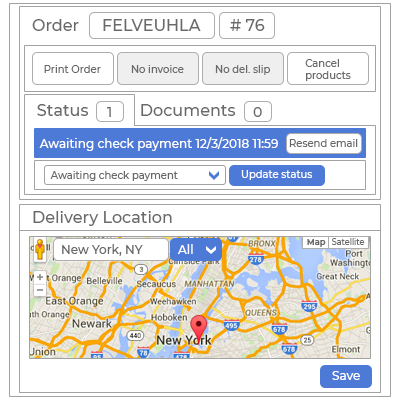 A delivery location link on the checkout page by clicking on which the customers can set their delivery location in case they have not set. Set or change delivery location for customer's address from the backend. The store admin can also change the delivery location of orders. It saves admin's time as the exact location for every order is marked by the customer and it does not have to find on map. Did you buy Prestashop Set Your Delivery Location? Honestly these guys go beyond the mile helping solve issues related to the module. It is awesome to buy their products. I truly recommend them.